I have basically given up on John Barber's Transformers, but given I'd read the first two installments of the "Redemption of the Dinobots" trilogy, and given each is only forty pages long, it seemed worthwhile to finish it off. This was a very predictable page-turn moment. Well, maybe it was or maybe it wasn't. I like the idea of the Dinobots, bred for war, trying to find their place in a postwar universe, and I like the idea of them finding that in defending Cybertron's first field of new sparks. But the actually story here is disjointed and confusing, and like too many Transformers tales from the late IDW period, revolves around an ancient evil coming back to haunt the present. Like, the emotional meat of the story is not that! Give me the Dinobots! Instead, they feel lost on the edges of a story that's got too much going on for its page length. 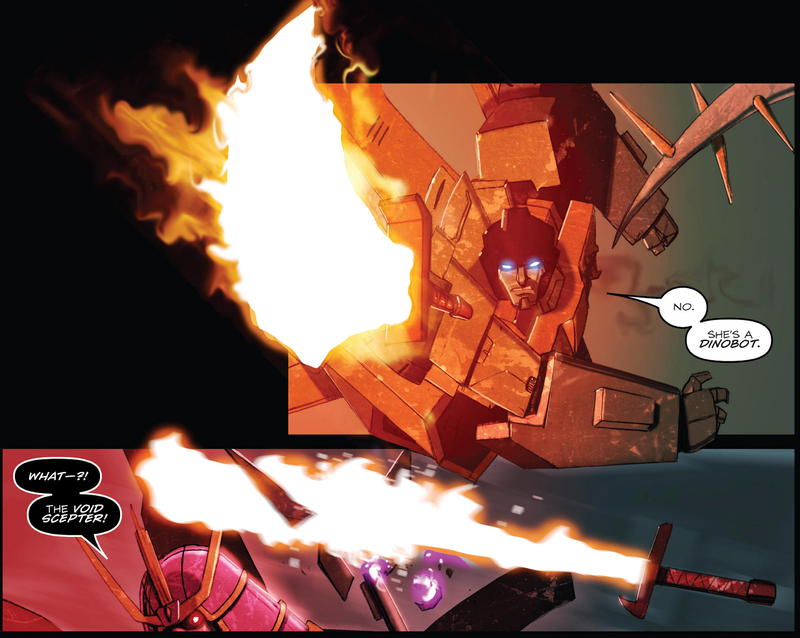 Next Week: Meanwhile, also on Cybertron... Starscream finds himself swept up into an unexpected belief that he's waiting until Till All Are One!